Wing Lok East Street/Morrison Street in 1965 where the giant signs of Chinese distilleries such as Yan Wo Yuet and Wong Kwong Shin Tong were visible. Originated in Shiwan (石湾 or Shek Wan) in Foshan, Chan Tai Kut was best known for inventing the popular Cantonese wine – Yuk Ping Shiu. The distillery was founded in 1830 by Chan Ping-yin (陳屏賢), whose alias was Tai Kut. Tai-kut’s son Foon-ying (陳寬英) took over the business but like most Chinese families at the time, pursuing a government career through examinations was highly encouraged within the family and one of Foon-ying’s sons Chan Yu-ngok (陳如岳, 1842-1914) scored well in the Imperial exams and became a mandarin. Yu-ngok was a classmate of the reformer Kang Yu-wei but he was very reluctant to join his classmate in usurping the Empress Dowager and ultimately he quit government in 1890 and returned home to tend to the family business. When Yu-ngok noticed how his clansmen (especially the older ones) clamored for the barbecued pork handed out at the annual celebration at the Chan family ancestral hall, he decided why not distill the Chan Tai Kut rice wine with the pork – and thus the popular Yuk Ping Shiu (玉冰燒, Yuk means jade which has the same pronunciation as meat in Cantonese) was invented. Over time, Yuk Ping Shiu was not only popular in Guangdong province but became a major product in the national level alongside wine from other provinces such as Wuliangye and Maotai. When Yu-ngok died in 1914, his son Chan To-Foo (陳道富) expanded the business significantly and by 1920, there were 4 Chan Tai Kut stores in Canton covering all four corners of the city and two production lines producing 2400 catties per day, which was quadrupled the capacity when he took over. Distilleries were established in HK and Macau and the products were sold throughout Southeast Asia and beyond. Its HK store was located at 108 Wing Lok Street West and its Macau distillery was located at 50, Rua Camilo Pessanha. In 1952, the Chan Tai Kut Distillery in Canton became a public private enterprise and ultimately became part of the state owned Shiwan Wine Co. Meanwhile, the Chan family continued to operate Chan Tai Kut in HK and Macau. In the 1970s, the firm still had its store at Wing Lok Street and Kowloon branch at 222 Portland Street in Mongkok (which was burglarized in 1972). Chan Tai Kut Wine Store Ltd was incorporated in 1974 and dissolved in 1984. Yan Wo Yuet Ad from the 1960s. Yan Wo Yuet (not to be confused with Yan Wo Wine which was founded in 1963) traced its roots to Foshan and was founded probably in the 1870s. 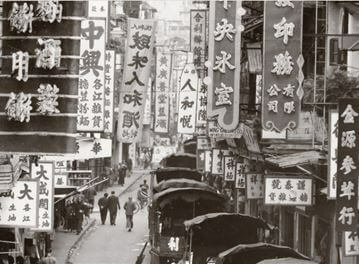 By the 1920s, a HK branch was established and in 1926, it began to operate out of 133 Wing Lok Street. In 1927, it filed for its trademark – which feature the 2nd century AD poet Liu Ling (known for his love of alcohol) next to a giant wine container with the characters “centuries old wine container”. Left: Obituary of Tse Shun-yu, proprietor of Yan Wo Yuet in 1971 (Source: Wah Kiu Yat Po, 1971-1-22) Right: Yan Wo Yuet main store on Hennessey Road with its giant wine bottle neon sign before its re-development into Yan Wo Yuet Building in 1966. The firm was very savvy with marketing – it was constantly on the news for its philanthropy and sponsorship of Cantonese opera and it also came up with the catchy tagline – “有人和悅冇人愁” (No one is down when you have Yan Wo Yuet). At its peak in the 1960s, the firm had 6 branches in HK – its main stores in Hennessey Road, 2 branches in Mongkok (both on Shanghai Street), 2 branches in Sham Shui Po (Nam Cheong Street and Tai Po Road) and Mo Woo Street in Hunghom. The head of Yan Wo Yuet during this period was Tse Shun-yu (謝遜儒, 1903-1971). Outside of Yan Wo Yuet, Tse was permanent honorary chairman of three organizations – the HK & Kowloon General Association of Liquor Dealers & Distillers, HK Chiu Lun Clansmen Association (昭倫公所) and Chung Sing Benevolent Society (鐘聲慈善社). 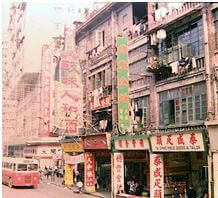 In 1966, the firm’s main store at 432-436 Hennessey Road in Causeway Bay was re-developed into Yan Wo Yuet Building. After Shun-yu’s death in 1971, he was succeeded by his son Tse Yan-hang (謝恩衡). Yan Wo Yuet Ltd which was incorporated in 1964 is still a live company. Hang Lam Chong was one of the oldest distilleries in Hong Kong. In 1909, the firm registered its trademark with the HK government and its address was listed at 194 Hollywood Road. By the 1930s, it was operating out of 29 Connaught Road West. In 1931, the firm got into legal trouble as the 40 cases of wine shipped out by the company turned out to be water upon inspection by the customs. The executives of the firm were brought to trial, where the firm’s chief Wong Yu-pak (黄如伯)was acquitted as the head of its wine cellar Leung Tong (who was represented by the solicitor Man-Kam Lo) pled guilty. In 1933, the firm registered the trademark for Five Dragons Two Tigers brand of wine. Hang Lam Chong Wine Traders Ltd was incorporated in 1938 and dissolved in 1995. In 1990, the Hang Lam Chong Building was built in Sheung Wan. Lai Woo Tseung (also spelled Lai Woo Cheung or Lai Wo Cheung) was a major distillery from before the War operating out of 258 Hollywood Road. It was operated by Lo Sum Kee (勞森記), a wine merchant based in 280 Queen’s Road West in 1913 and was founded sometime in the 1850s. According to its label it also had branches in Canton, Tientsin and Macau. Aside from making its own Chinese wine, it also distributed wine made by Wing Fung in Tientsin. In 1914, it registered its Double Bottle trademark with the HK government. After the War, the firm lost its popularity. Left: the old Lai Woo Tseung’s store on Hollywood Road on the left; Right: label of Lai Woo Tseung’s wine from the Republican era. In 1920, a native of Kow Kong in Nanhai by the name of Cheung Pun-chuen (張品全, 1880-1970) came to HK to establish Cheong Yuen on Possession Street in Sheung Wan, bringing with him the proprietary technique of making Yuk Ping Shiu from his hometown. By the 1950s, Cheong Yuen was one of the big three Chinese wine makers in Hong Kong and in 1966, the firm was incorporated. 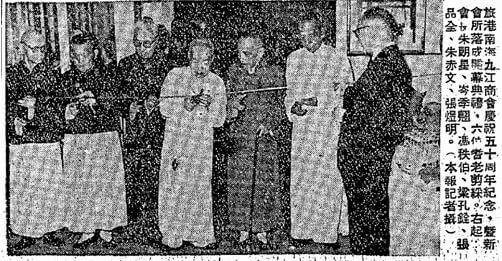 While Wong Sewai of rival Wing Lee Wai was a Buddhist leader, Cheung Pun-chuen of Cheong Yuen was a Taoist leader and was involved with the Fung Ying Seen Koon (蓬瀛仙館,founded in 1929) in Fanling, the Wun Chuen Sin Kwoon (雲泉仙館, founded in 1944) in New Territories and Tung Sin Tan (通善壇, founded in 1938) in Central as a priest. 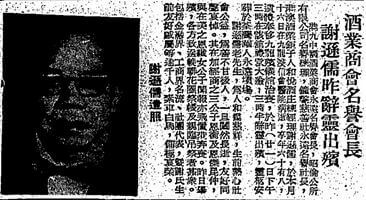 In September 1970, Cheung Pun-chuen died at the HK Sanatorium at the age of 90 and he was succeeded by his son Cheung Keng-chi (張鏡池). In 2000, the elderly Cheung Keng-chi sold out to the Sun brothers from Swatow who had no prior experience in the wine business. The brothers moved the production out of the store at Possession Street to an industrial building in Chai Wan. Win Seng Wo was one of the Big Three Chinese rice wine makers in HK during the 1950s. 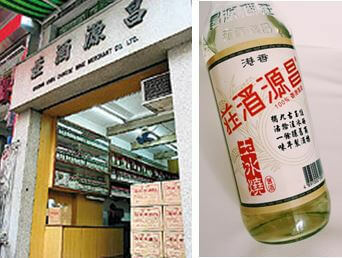 Its store was located at 111 Bonham Strand East and was known for its Red Label Sheung Ching wine (雙蒸, which means double boil, referring to the distilling technique which 26-30 proof). 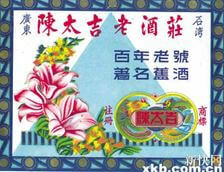 It also distributed Tin Po Tong (天寶堂) ’s “Dragon, Tiger and Phoenix” Wine. Under the leadership of Lui Ka-shek (雷家碩, 1897-1970), the distribution network for Win Seng Wo expanded to over 1000 outlets in HK and abroad during the 1950s and 60s and also had a branch in Macau. In 1970, Lui Ka-shek died and was survived by his wife Grace Sinn (1897-1982, daughter of the Eurasian community leader Sin Tak-fan and maternal aunt of Macau casino king Stanley Ho) and three sons. His third son Peter Lui Woon-ting (雷煥庭, 1939-) succeeded him as managing director of Win Seng Wo but also built a large architectural practice in partnership with Andrew Lee King-fun (the English name of the practice was AP Architects but now AKF+ although the Chinese name still contains the names of Li and Lui) which was responsible for many projects in HK and China since its inception in 1962 including the Jingan Hilton and Sofitel Pudong in Shanghai and Yau Yat Chuen Garden City Club and 100QRC in HK. Winsengwo Wine Ltd was incorporated in 1975 but had dissolved in 1996. In 1988, Yan Wo Wine (founded by Mok Siu-kei 莫紹祺 who used to work for Lai Wo Cheung) took over the production of Win Seng Wo wine which was win-win situation for both as Win Seng wanted to exit production and Yan Wo needed a strong brand. Yan Wo has been producing Chinese wine in Zhuhai from 1982. Kie Fung Yuk traced its origin to Kie Fung Hong (岐豐行), a major trading house in the Nam Pak Hong community in the early 20th century founded by Lo Cho-sun (盧佐臣), a Dongguan native who served as chairman of Tung Wah Hospital in 1884 and was a founding benefactor of HKU. Fung Ping-shan, the co-founder of Bank of East Asia and father of Sir Kenneth Fung was also a backer of Kie Fung Hong. 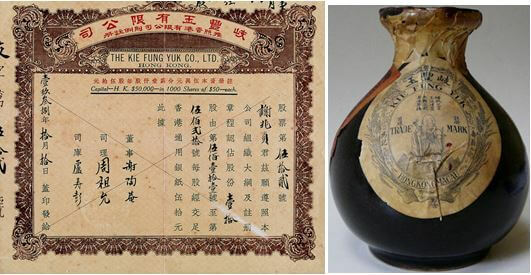 Kie Fung Hong was a distributor of Wing Lee Wai’s wine which might have been what prompted them to enter into the wine business themselves by establishing Kie Fung Yuk, Yuk being Yuk Ping Shiu wine. In 1921, Lo’s son Lo Lai-shuen (盧禮孫) was the applicant listed for the registration of Kie Fung Yuk’s God of Longevity trademark with the HK government (later it also marketed using the trademark of a village scene in Southern China) and the address listed was 11 Bonham Strand West. Kie Fung Hong was deeply impacted by the 1925 HK Canton strikes and Lo passed away the next year. The firm closed in spring of 1927 but thanks to the fundraising efforts of Lo’s fellow clansmen managed to re-open later in the year. In 1938, the firm was re-organized as The Kie Fung Yuk Co Ltd under the leadership of Kai-Chu Jay (謝啟鑄, who also went by Tse To-Im 謝陶庵, 1906-1982). In addition to Kie Fung Yuk and his family’s pawnshop business, K.C. Jay worked for the HK branch of Bank of China for over three decades until his retirement from the Bank in 1965 during which he was a major player in the forex business in HK and served as chairman of the HK Foreign Exchange and Deposit Brokers Association and on the government’s banking advisory committee. Outside of business, KC Jay had many interests including horseracing (he was the owner of “Top Gain”, the winner of the 1978 HK Derby), dog (he was the first Chinese president of the HK Kennel Club in 1970) and horticulture (he was a major collector of penjing). For his contributions, he was awarded the CBE in 1978 and was also a Justice of the Peace. Kie Fung Yuk prospered in the 1950s and 1960s when it sold well domestically and abroad. The company is still live today but its wine had since faded from the HK market. Wong Kwong Shin Tong, which operated out of 45 and 109 Wing Lok Street, was one of the oldest wine and medicine companies in Hong Kong. In 1910, its proprietor was listed as Wong Big-Yu. In the 1920s, Wong Hing-kwong (黄慶廣) took over and incorporated China Distillery (Wong Kwong Shin Tong) Ltd in 1924 with distillery in Stanley. According to the memoirs of Stanley Kwan (father of the Hang Seng Index) who was related to Wong since his brother Kwan Man-kwong married Wong’s daughter Amy, Wong Hing-kwong had a large family which his wife, concubine, 7 sons and 6 daughters. He attended DBS and graduated from HKU with an economics degree in 1918. (his three oldest children – daughter Wai-sheung and son Man-hung and Man-shun also went to HKU). China Distillery registered the Diamond brand trademark in 1926. Its wine was popular and even Madame Sun Yat-sen who was living in HK in the 1930s and was not a big drinker was a fan. 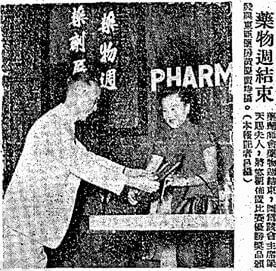 Aside from liquor, Wong Hing-kwong was also involved in the medicine business through China Dispensary (see article) and the East Asia Pharmacy located at the King’s Theatre building in Central. During the War, Wong accurately anticipated the Japanese occupation and his stockpile of rice, salted fish and kerosene sustained his family during those difficult years. Almost killed by the bombing of Wanchai during the Japanese occupation, Wong never fully recovered from the trauma of the war years and became very wary and distracted after the War, often going to his distillery in Stanley and villa in Macau to destress. The firm was dissolved in 1976. Ka Wo Distillery, which had its office at 68 Des Voeux Road and factory at 22 Ka Wo Street in Aberdeen West was incorporated in 1957. It was founded by Cheng Kwai-fun (鄭桂芬), who was an active supporter of education. In 1953, Ka Wo opened a branch on Cheung Chau island where Cheng also worked with Chan Shu-woon to tried to establish an English school in 1958 and served as chairman of the local Boy Scouts chapter. Ka Wo also opened a Kowloon branch in 1964. It appeared that Wing Lee Wai had manufactured some of its Ng Ka Py at Ka Wo Distillery. One of the directors of Ka Wo was Chiu But-yu (趙弼予), who was chairman of Sinda Taxi (先達的士), a major taxicab firm founded in 1964 which was brought into the limelight in recent years when former legislator Maria Tam failed to disclose her family’s interest in the firm while serving as chair of the Transport Advisory Committee. Ka Wo Distillery as a firm was dissolved in 1976. Lai Chan appeared to be sizeable distillery of Chinese rice wine at one point and in the early 1950s, it even had its own basketball team. Operated out of 99 Queen’s Road East in Wanchai, all that is left today is the signboard in its old building in Wanchai. The firm appeared to be run by the Szeto family – in 1965 its manager was listed as Szeto Wai and in 1998 its officer was listed as Szeto Keung. This article was first posted on 22nd September 2017. Caldbeck, MacGregor & Company Ltd – HK branch opened in 1889 established in 1864, and became the largest and best known HK company in the wine and spirit trade in the East. 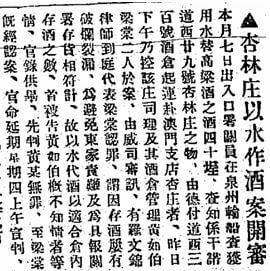 According to the 1949 HK Canton Macao Directory, the English name of the pharmacy which Wong Hing-kwong operated should be King’s Dispensary instead of “East Asia Pharmacy” in the article which is a translation of its Chinese name.